If you’re more on call and texts type subscriber, subscribe to the combo promo that gives you unlimited calling to Globe/TM and unli-texting to all networks for 7 days. 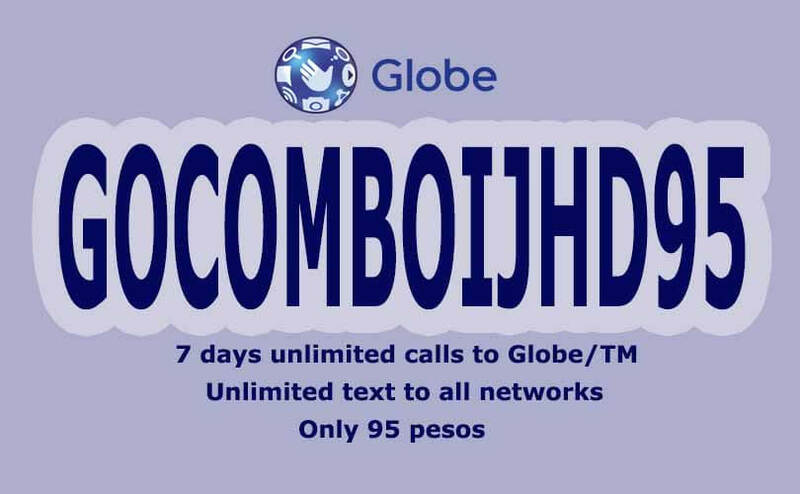 The answer to your needs is the GOCOMBOIJHD95, register once a week for only 95 pesos. You can also enjoy free Facebook access and 100MB mobile data that you can use to surf the internet. Do you like the all out call, text and surf services combination offered by Globe? Let us know what you can say about this promo offer. You can use subscribe to this GoSakto promo, you can use *143# USSD menu using your Globe prepaid SIM. If you prefer to register via SMS text, use the given keyword format below. "Congratulations! You have successfully create your own promo, GOCOMBOIJHD95 with Globe Prepaid GoSakto. Now enjoy unlimited calls to Globe/TM (Touch Mobile) and text to all networks, 102400KB surfing valid for 7 days. To check your balance or end of subscription. dial *143#. This promo is subject to Globe's Fair Use Policy." Here’s a tip, if you want to add more data. Register to GOTSCOMBOED52 to get 1GB of mobile internet for an additional 52 pesos. After registration text GOSAKTO STATUS, to know the status of your promo. To stop just text the keyword GOSAKTO STOP then send to 8080.
dial the globe # directly.